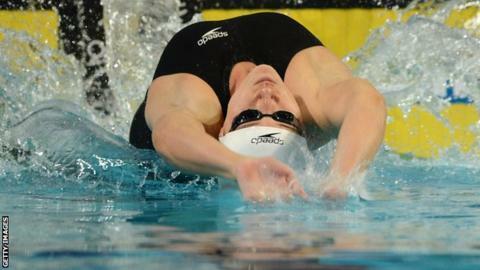 Lizzie Simmonds won 50m backstroke gold and 200m bronze at the Beijing World Cup on the day it was announced she had lost her funding from British Swimming. Compatriot Sophie Allen also impressed, setting a new British record en route to a silver medal in the 100m breaststroke. She also won bronze in the 200m individual medley. London 2012 silver medallist Michael Jamieson was second in the 200m breaststroke, while Francesca Halsall, who won World Championship bronze, took 50m freestyle silver. Bath ITC swimmer Simmonds, 22, is a two-time European gold medallist but lost her funding after failing to qualify for this year's World Championships. Only 62 swimmers are to receive funding, compared to 97 who were supported in the build-up to London 2012. Roberto Pavoni narrowly missed out on adding to Great Britain's medal haul on day one when a personal best of 4:08.35 was only good enough for fourth in the 400m individual medley. Siobhan-Marie O'Connor, 17, had a similar result, posting a personal best of 1:55.26 for fourth place in the 200m freestyle. The Beijing meeting is the eighth and final event of the 2013 World Cup series, which ranks swimmers by awarding points for medals and times. Going into the event, Jamieson was Britain's top-ranked male swimmer at 12th in the world, with Allen 14th in the women's rankings. Hungary's Katinka Hosszu and Chad le Clos of South Africa lead the rankings. Jamieson, Allen, Halsall and O'Connor will all compete at next month's European Short Course Championships in Denmark.